Using the Pedersen designed 'self energising' system, these brakes take the rotation of the rim and turn it into braking energy. As the pads contact the rim, they 'energise' the canti arms, dragging them slightly forwards and further inwards, thus creating extra braking power. Made in Japan, 240g per pair. 50mm brake pads use plain stud fitting. ConsMore cyclists hate them. Now archaic, obsolete. Many cyclists mock and hate these obsolete brakes but decided to give em a try. Excellent Bike shop. No option for cheap shipping ($33 from UK to USA) but shipped super-fast. Excellent customer service. These may be old tech, but admirably suited to bringing braking on an '80s canti equipped tourer just about up to an acceptable standard. I like to be able to lock up the back wheel as a last resort (put it down and slide!) and the SE will do that. Buy one while you still can. ProsEasy set-up, work really well front or rear. Cheap as chips! Great brakes! Easy to set up (if a little quirky, but a great idea really!) Can't fault them on price. Despite these being billed a 'rear only' I've got a pair up front as well on my tourer. Work brilliantly. Buy some now!! I wouldn't use these if I could get a 'V brake' on the rear but with my frame and carrier these are the best stopping power I can fit. Not too bad setting up if you follow the instructions carefully but they need resetting once the blocks wear a bit (you can't just adjust the cable and get the same performance). The cable clamp is a weak spot and the thread strips eventually. I drilled straight through and clamped with a suitable nut and bolt which worked fine but not as elegant! Bargain at this price! Hi, Is Straddle Cable And Hanger Included? The only thing that is included is the brakes themselves. Cantilever studs are mostly 8mm diameter, but exist also as 10mm (like mine) and even 12mm. If you can confirm that the Suntour is for 10mm studs then great! Do you have an equivalent for the front brake? 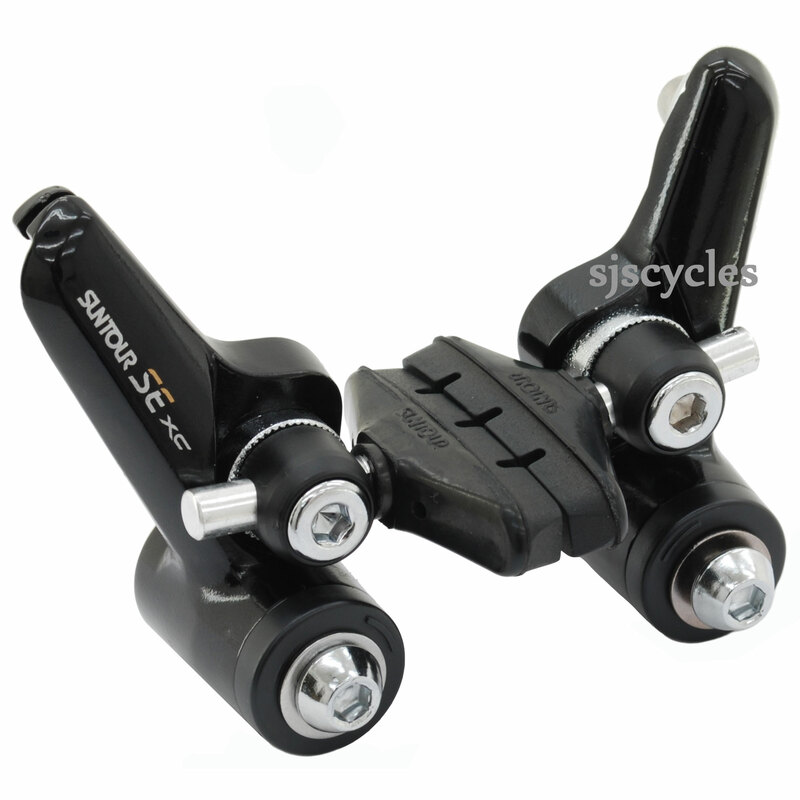 Please ignore my previous message, the Suntour brakes do in fact fit to 8mm cantilever studs, so will not fit your bike. I'm sorry for providing the incorrect information previously.